Sleep is an integral part of your life. Getting enough – or not – can make a huge difference in your overall health, both body and mind. There’s a difference between “just getting sleep,” and “high quality sleep.” High quality sleep helps your body function properly. You know how it feels to have to go through a workday after very little sleep? Those days are ROUGH all on their own, but too many of them could contribute to long-term health issues. Chronic diseases like diabetes, heart disease, high blood pressure and obesity have all been linked with chronic inadequate sleep. Even mood disorders, like anxiety and depression have been linked with insufficient sleep. In part, this is because inadequate sleep throws your hormones out of whack, which leads to increased cortisol (a.k.a stress) levels, as well as compromised brain activity and decision-making skills. Now all of the above creates the perfect storm of mental & physical challenges that can potentially impact your health and overall fitness goals. By not getting enough, you’re putting yourself at risk of making poor choices when you’re snacking and overeating in general – thus taking you farther from your health and fitness goals. 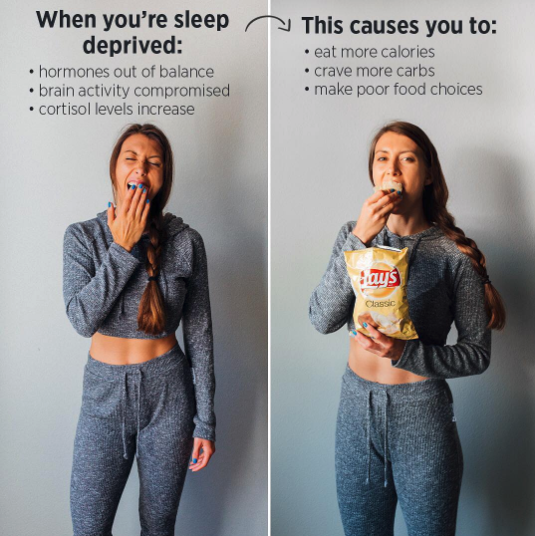 Studies show again and again that sleep deprivation, even just 80 minutes less than average per night, can cause you to feel hungrier throughout the day and feel stronger cravings for junk foods and nighttime snacks. Over time, not getting enough sleep in conjunction with snacking on junk food, can lead to those chronic diseases – obesity, diabetes and beyond. Get a blackout curtain – Light can keep you awake. Make your bedroom nice and dark, like you’re sleeping in a cave. Set a caffeine curfew – Caffeine takes a while to wear off, so try cutting it out after 2pm. Don’t eat a big meal too close to bedtime – otherwise you’ll still be digesting and may have trouble getting to sleep. Invest in blue light blocking glasses – Blue light from screens suppresses melatonin, the hormone that makes you sleepy, so limit your exposure in evenings. Create a calming nighttime routine – aka sleep hygiene! Things like reading, limiting screen time, and taking a bath all count here. Wear an eye mask – Another way to block out light that might keep you up. Do you have a nighttime routine already? If you do, what’s the most relaxing part about it? If you don’t, what habit will you add in first? Feel free to leave a comment below so I can see how YOU are prioritizing getting that high quality sleep.